ASK modulation involves mapping the input bit stream to ASK symbols (as specified by the ASK symbol map), interpolating by zero-insertion, and applying the pulse-shaping filter to the interpolated I/Q data. Sequence of information bits to be modulated. The desired symbol rate, in hertz (Hz). This value must be positive. An ordered array containing the desired sample-spaced coefficients for the pulse-shaping filter. Wire the pulse shaping filter coefficients parameter ofMT Generate Filter Coefficients to this parameter. When you generate the filter coefficients, ensure that the value of the pulse shaping samples per symbol parameter of MT Generate Filter Coefficients is equal to the value of the samples per symbol element of the ASK system parameters cluster, which is passed to this node. When you configure reset? 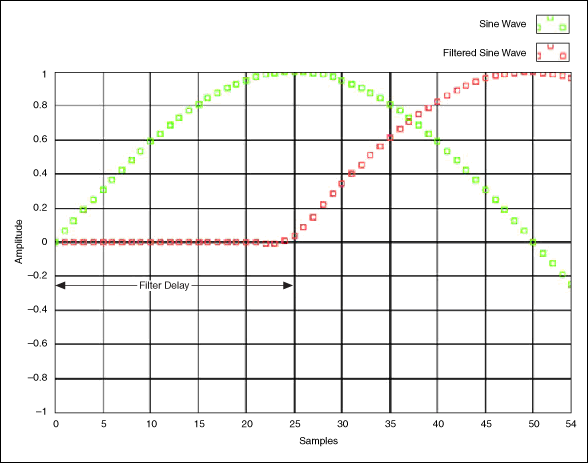 to TRUE, there is a transient response of half the filter length at the start of the modulated signal, and the output data is shortened by approximately half the filter length. When you configure reset? to FALSE, the node uses data from the previous iteration to eliminate the transient. The array of mapped symbols before pulse shaping is applied. The array represents the complex value of each mapped symbol.